Monkeys, Cheerleaders and the DMCA... Oh My! Copyright © 2018 Mark H. Barinholtz. All rights reserved. This past year has been thought-provoking from a copyright case law standpoint. Federal Courts at all levels weighed in on copyright issues. From a purely superficial point of view, the convergence of dispute scenarios is diverse as: whether non-humans (e.g., a monkey) can be considered an "author" under the Copyright Act; whether the designs of cheerleader uniforms are copyrightable; and whether a suit under the Digital Millennium Copyright Act (DMCA) can be asserted as a stand-alone claim. So, has the time come for non-human "creators" to be accorded copyright protection under our laws and in our courts? What makes garment design "conceptually separable" from the useful article it adorns or is incorporated into? And, can an author bring a claim for violation of the DMCA, without a copyright registration? Although there were many other cases filed and resolved this past year interpreting copyright jurisprudence, this article examines three that caught my attention. In this digital era, the advent of the "selfie" has become a staple of the photos stored on everyone's smart phone. For example, we're all familiar with Bradley Cooper's selfie with Ellen DeGeneris and others at the 2014 Oscars. So, why not extend protection for such a work to a clever monkey? Naruto is a charming guy, always smiling (See this link). He lives on an island in the South Pacific. He is concerned with and respected by his community. He's accustomed to being around cameras. So why won't the Federal Courts and the Copyright Office allow him to own the copyright in a "selfie" he took? Is it just because he's a monkey?! In a well-publicized case, California federal courts were asked to grapple with the issue: Has the time come for non-human "creators" to be accorded copyright protection? That was the core controversy in Naruto v. Slater, a case involving the issue of whether animals who appear to create are entitled to protection under the U.S. copyright laws in our Federal Courts. In a California District Court, the case was also couched in technical terms involving the concept of standing, a legal doctrine implicated under both Article III of the U.S. Constitution and under the Copyright Act. Initially filed as a copyright infringement suit in the District Court, the case was brought by People for the Ethical Treatment of Animals (PETA) and a few other "friends" on behalf of Naruto, a 6-year old crested Macaque. 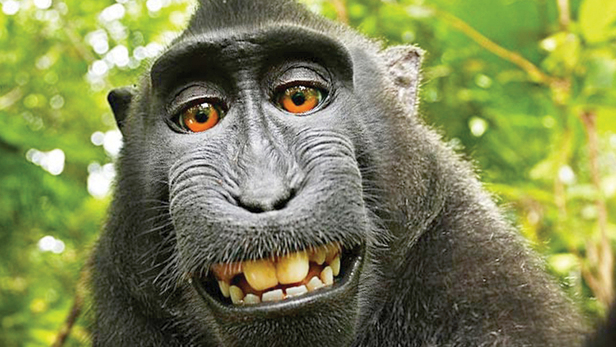 The defendants, including photographer David Slater and his publisher, distributed a book which contained the monkey selfie allegedly "taken" by Naruto. PETA argued Naruto should get a share of the proceeds as a copyright holder. In addition to the factual background, the District Judge looked at and analyzed the plain language of the Copyright Act, past judicial interpretations of the meaning of "authorship", and guidance from the Copyright Office's Compendium of Copyright Office Practices. The District Court, recognizing Naruto as a "non-human," ruled the monkey could not be an "author" under the Act, and thus had no standing to assert his claims. Naruto appealed. During the appellate process the case was settled. No final decision was judicially uttered, other than whether the parties could consent to the appeal being dismissed directly by the Ninth Circuit. Although we may never see this issue litigated to final verdict, the Ninth Circuit Court of Appeals did discuss the lower court's ruling. In allowing the settled case to be dismissed directly out of the Court of Appeals, without sending it back down to the District Court for such purpose, the Ninth Circuit did appear to leave in place the District Court's decision holding that Naruto, as a non-human, did not have standing to assert his claims under the Copyright Act in our Federal Courts. Rah Rah, Sis, Boom, Bah! In 2017, the United States Supreme Court decided to review rulings involving the designs of cheerleader uniforms and whether such garment designs may be considered conceptually separable from the useful articles they adorn or are incorporated into. 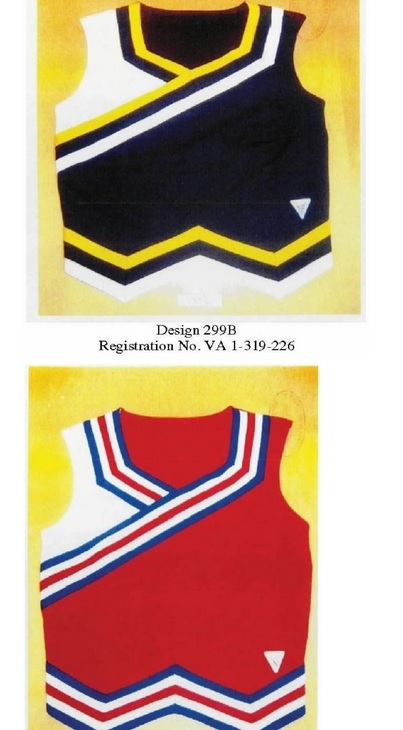 Some years go, Varsity Brands, a fashion firm which designs and manufactures cheerleader uniforms, had registered a number of copyrights in two-dimensional artwork depicting designs for cheerleader uniforms. Some years later Star Athletica, a competitor of Varsity Brands, created cheerleader uniforms which were similar in design to Varsity Brands' uniforms. The overall designs consisted of combinations and arrangements of various elements (See, e.g., this link). Varsity Brands sued Star Athletica alleging copyright infringement. The District Court tossed the case, ruling that Varsity Brands' designs did not qualify for copyright protection as "protectable pictorial, graphic or sculptural works." The Court reasoned the designs merely served the utilitarian function of identifying the garments as cheerleading uniforms. Varsity Brands appealed. On appeal, the Sixth Circuit reversed, finding the Varsity Brands' designs were conceptually separable from the utilitarian aspects of the cheerleader uniforms, and thus were capable of existing independently as works of two-dimensional visual art, whether used to adorn the surface of a blank cheerleader uniform or even hung on a wall as framed art. Not satisfied with that outcome, Star Athletica petitioned the United States Supreme Court to reinstate the District Court's decision. The Supreme Court took the case to clarify and reconcile certain language found in Copyright Act Section 101's definitions of "useful article," which refers to non-registrable "utilitarian function" on the one hand, and "pictorial, graphic and sculptural works," which refers to features which can be identified separately from, and are capable of existing independently of," the utilitarian aspects of the article," on the other. Writing for the majority, Justice Clarence Thomas articulated a two-part test for making some sense of it all. The Court stated that first, the decisionmaker need only look at the useful article to identify whether some two- or three-dimensional element thereof appears to have some pictorial, graphic or sculptural qualities - a basic observation. Second, in order to satisfy the "independent existence" requirement, the decisionmaker must decide whether the separately identified feature has the capacity "to exist as its own pictorial, graphic or sculptural work," apart from the utilitarian aspects of the article - a somewhat more difficult requirement to satisfy. In the end, the Supreme Court cautioned that its opinion, affirming the Sixth Circuit Court of Appeals, should not be taken as meaning that the "shape, cut, and physical dimensions" of the cheerleading uniforms are to be construed as eligible for copyright protection. Rather, that certain "combinations, positionings, and arrangements of elements," including "chevrons ..., lines, curves, stripes, angles, diagonals, inverted [chevrons], coloring, and shapes," could qualify as protectable pictorial, graphic or sculptural works apart from the garments. Thus, the Supreme Court held that the designs on the surface of the Varsity Brands cheerleading uniforms satisfy both the "separability" and "independent existence" requirements, and therefore the Sixth Circuit Court of Appeals' decision, finding copyrightable authorship in Varsity Brands' designs, would be AFFIRMED. Hey buddy, that's my work?! Having litigated a number of Digital Millennium Copyright Act (DMCA) claims over the years, I was pleased to see that Federal Courts are making it clear that an author may bring a claim for a DMCA violation without a copyright registration. In the case of Gattoni v. Tibi, a professional photojournalist sued a New York City fashion firm over use of her photograph of a woman in a long dress walking down an empty street in Morocco. Gattoni had posted the photograph on her Instagram page ( See this link ). Gattoni's post was allegedly accompanied by such indicia as a claim of authorship in her name and a reservation of rights. Tibi decided they liked the photo. But when Tibi reproduced the image on Tibi's own Instagram page, they not only cropped the photo itself, but also cropped out Gattoni's name and allegedly other copyright management information. Gattoni sued for copyright infringement and violations of the DMCA. Tibi moved to dismiss the action, claiming that since Gattoni's application for copyright registration was merely "pending" when her initial complaint was filed, as opposed to having been "acted upon" by the Copyright Office, the entire action should be tossed. The court tentatively dismissed the infringement claim only, "without prejudice," and allowed Gattoni leave to file an amended complaint to reference her copyright application which by then had been acted upon and registered. Significantly, the Court allowed the DMCA claim to stand regardless of the status of the copyright application. In deciding the photographer was entitled to continue to assert her claim for violations of the DMCA, the Court clarified several concepts which brought various strands of DMCA jurisprudence together to distill a plain statement of the law. First, the court held "[P]laintiff's failure to register [her] copyrighted work is not a bar to [her] DMCA action." Additionally, the court supported its finding, by noting that claims under the DMCA "are simply not copyright infringement claims and are separate and distinct [from infringement claims]." The Court's ruling emphasizes that procedural or theoretical snafus, e.g., matters delaying a plaintiff's copyright registration, will not prevent a plaintiff's DMCA claim from moving forward. Following only several months after the Gattoni decision, another Southern District of New York federal Judge, in Hirsch v. CBS Broadcasting, found the Gattoni rationale to be persuasive authority, ruling the absence of a copyright registration is not a bar to a DMCA claim. Last year, my office litigated such a controversy. During 2016 and into 2017, I represented famed Chicago Rock & Roll photographer Paul Natkin in a case where this very issue was presented. For nearly four decades, Natkin has photographed music events and personalities including The Rolling Stones, Bruce Springsteen and Prince, among many others (See, http://natkin.net ). Although the facts alleged in Natkin's case suggested circumstances giving rise to an ongoing claim for infringement, the strategic decision was made that the complaint assert only one claim, i.e., for violations of the DMCA. After more than a year of litigation, the dispute was resolved amicably by settlement. Despite no admission of liability on the part of the defendant, the resolution of the case included a Court Order that defendant deliver up certain photographic materials to Natkin, and discontinue any further use of Natkin's images, a form of Court mandated cease and desist. It was a good example of how our District Court recognized such principles, i.e., that a DMCA claim - even without an asserted copyright infringement claim supported by a copyright registration - could stand on its own. It's an entertaining time, when monkey selfies, cheerleaders' uniforms and copyright management information disputes converge in a single year. But that's what our Courts are there for - to make sense out of the disparate, to bring meaning and closure to the tough cases. Last year was a good example of that mix. Copyright © 2018 Mark H. Barinholtz.